It has always been a major goal of Damasko to design a watch case with superior resistance against scratches, knocks, and general wear, but the materials commonly available, including the rather soft titanium definitively do not feature the necessary characteristics. The term 316L describes the kind of steel which is predominantly used in the watch industry. It features good corrosion resistance but is also relatively soft. 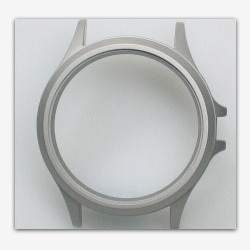 Occasional knocks with a watch made from this material will often lead to serious scratches or dents. Although there is the possibility to harden the surface of 316L (1.4435) or 1.4301 up to 1200 Vickers by diffusing carbon into the top layers of the steel, there is no way to temper the material. Due to the austenitic structure of the alloy it is impossible to make sure that that steel remains its hardness throughout the body. Various tests have proved that this kind of surface treatment is not suitable for Damasko watches because it only hardens the top layer of the metal. This leads to the so-called egg-shell effect. An ordinary pair of tweezers are able to dent and scratch the “hardened” surface (which are normally made from spring steel) because the material underneath the hard layer was not able to withstand the pressure. Due to the reasons described above Damasko searched extensively for better alternatives. In 1994 after five years of research they took out patents for 20 closely related martensitic sorts of stainless steel which highly exceeded our expectations. They are absolutely nickel-free, offer a good corrosion resistance, and can be tempered up to 64 HRC/800Vickers which is four times the hardness of every other steel currently used in the watch industry. What makes this material so special is the fact that the molten steel is enriched with 0.35% nitrogen under high pressure. Nitrogen and carbon are responsible for the hardness of the alloy. Under normal circumstances it takes about 1% of carbon to temper a martensitic steel up to 60 Rockwell but the low nitrogen content of our steel only requires 0.35% of carbon to achieve this superior hardness and in addition to that leads to an excellent corrosion resistance which is many times higher compared to other temperable martensitic steels. Due to the special process of hardening Damasko calls this steel “ice-hardened, nickel-free stainless steel”. This material is patented for their applications and Damasko makes exclusive use of this pioneering material. The entire watch case, including hardened crown and pushers is designed, engineered, and machined at the Damasko factory near Regensburg. Until the end of 2002 Damasko supplied their cases to a well known German watch brand but from then on, the cases are only available through Damasko. After the special heat treatment mentioned above Damasko steel reaches a maximum hardness of 62 Rockwell which makes it superbly scratch-resistant. You have to search hard to find a common household item ( apart from a sapphire nail-file or a brick) that is able to scratch the case. The use of this steel in watch cases is patented by Damasko.